You would love to hear JJ after decades but oops something got more importance in event than the song. This august we have treat for ears, in many forms. First it was Coke Studio season 8, then many other songs came across our play list and now the veteran singer turned Maulna, Junaid Jamshed’s patriotic track which was much anticipated launched. Throughout this time I was urging to hear JJ’s pure and melodious voice, though his Naats are equally popular as his music was. 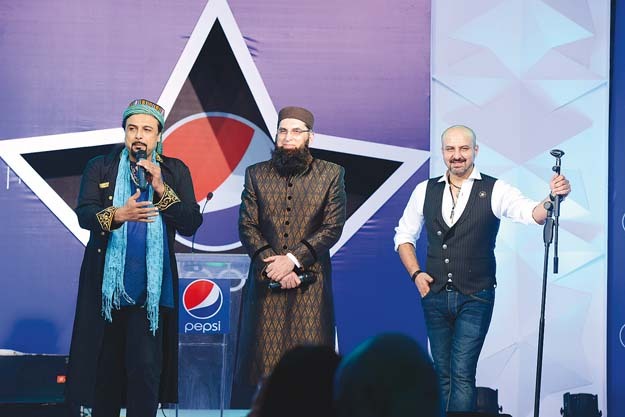 The start studded event by Pepsi Pakistan did not only launch the music video of track “Chand Sitara” written and directed by legendary director Shoaib Mansoor, but it also made JJ hit back the stage after several years. Along JJ it was Ali zafar, former Vital Signs members Salman Ahmad, Shahi Hasan Hadiqa Kiani and zoe viccaji reunited for this epic rendition. JJ somehow remained the center of attention, esp. on social media when his selfies and other photographs along his friends and past colleagues circulated. Hadiqa Kayani holding JJ’s hand or the chum’s group selfie was highly criticized. Apart from the main event, the selfies were made to hit social media and we saw memes slamming JJ on this. Junaid Jamshed who is believed to be a misogynist was highly under flames after his photographs took back stage. Well we love your melodious voice and even if you had fun time with your old buddies, I guess it’s completely okay with that. It isn’t a big deal but because of his controversial statements, the critiques also become very radical. Shoaib Mansoor said that it took 25 years for this song. Pepsi gave tribute to all the unsung heroes of Pakistan in this video and you might get a short trip to all the beautiful places of Pakistan.